Stop Yelling At Your Kids With This One Phrase That Works….every time. 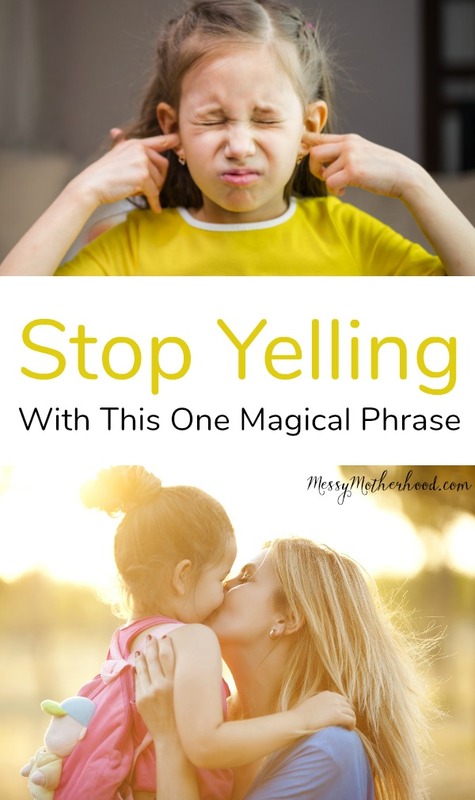 Inside: Learn how to stop yelling at your kids with this one magical phrase that will help you slow down, take a deep breath, then address the situation in a calm cool way. This post contains affiliate links. “STOP THAT!!! 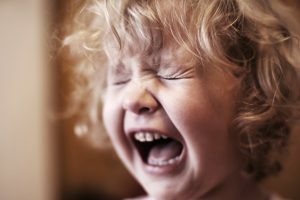 I DON’T LIKE THAT!” My 5-year-old screams at his brother so loudly that my ears start ringing. My heart starts pounding. With my anger raising, I take off down the stairs, taking two at a time. I’m in such a rush, I trip on the second to last step and fall hard on my rear end. As I sit, my oldest runs off to his room and slams the door, his brother stands wailing in the middle of the room. How I respond in these next few seconds will cause this situation to go one of two ways. It will either escalate into more anger, more tears, more slamming doors or I can handle it calmly. I sit for one second more and gather my composure. I go hug my youngest and ask him to tell me what happened, then we move over to his brother’s room so he can tell me his side of things. After a little negotiation, a few sniffles, tears, and at last a hug, I walk away from two laughing boys who are once again playing together. I’m grateful that I was forced to take a break on those stairs. That pause helped me gain my composure and deal with the situation without making it worse with my own anger. I’ve been teaching parents how to tame their temper in my program, Mama’s Anger Management, for a few years now. One of the very first things I teach is how to pause before reacting. 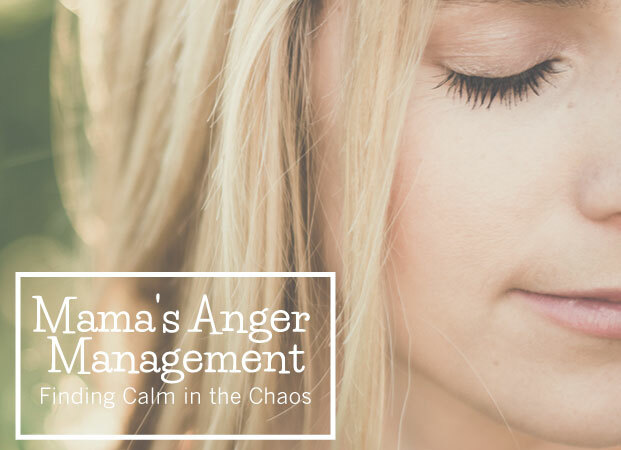 Taking a second to pause before reacting out of anger is the best way to stop yelling at your kids. But, it can be hard to do when you’re flooded with emotion. Anger triggers our body’s “fight or flight” response which means our heart rate and blood pressure increase, as well does the blood flow to our muscles, and it increases the production of adrenalin. 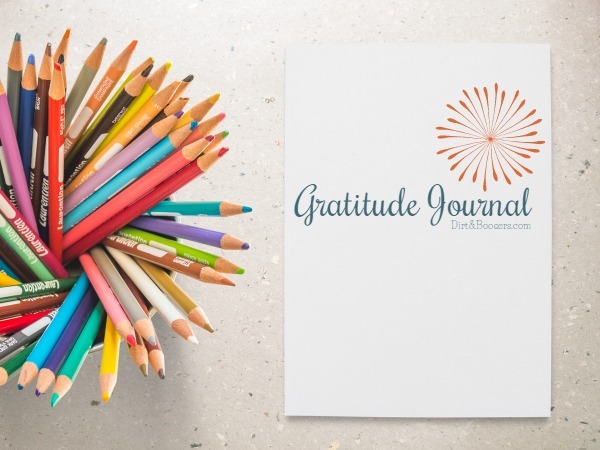 At the same time as these physical changes, anger sharpens our senses and we are able to make quick decisions, like judging if something is right or wrong. This can be extremely useful in emergencies so we don’t waste valuable time to respond to a threat. But…most of the time when we get angry at our children, there is no emergency. My boys yelling at each other? Not an emergency. Your son spilled their drink? Not an emergency. Your daughter not listening when you tell her to put on their shoes for the 4th time in a row? Not an emergency. I’d say 99% of the time when you’re frustrated and you feel the need to yell at your kids, it’s not an emergency. Yet, your body responds like it is. You’ll find that when you can take a second to pause and remind yourself that this is not an emergency and there’s no immediate danger, you can calm yourself down enough to respond without the anger. 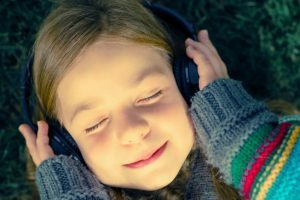 When we’re calm, we make better parenting decision and we’re more likely to respond appropriately instead of making unrealistic consequences like banishing our kids to their room until they turn 18. 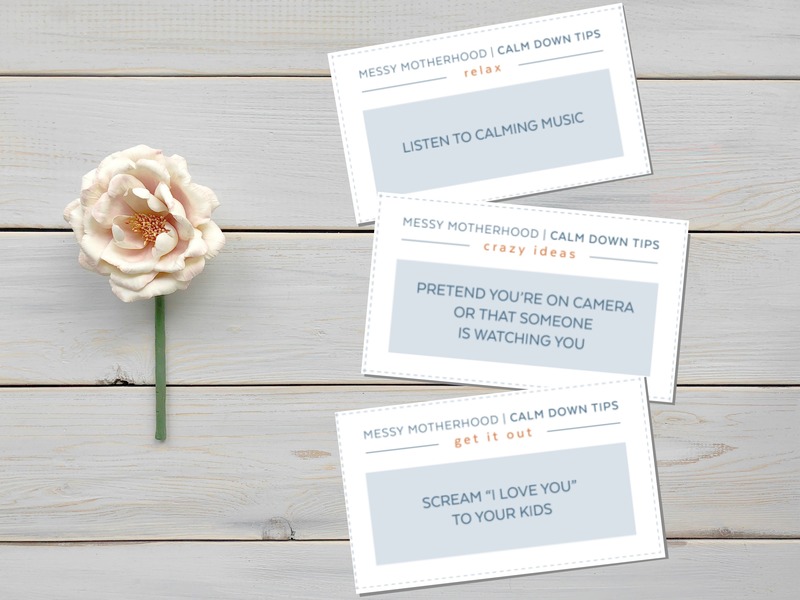 To help you learn how to pause and say “this is not an emergency,” I’ve created 50 Calm Down Cards for you to print out and place around your house, car, etc., as a way to remind you to stay calm when anger rises. 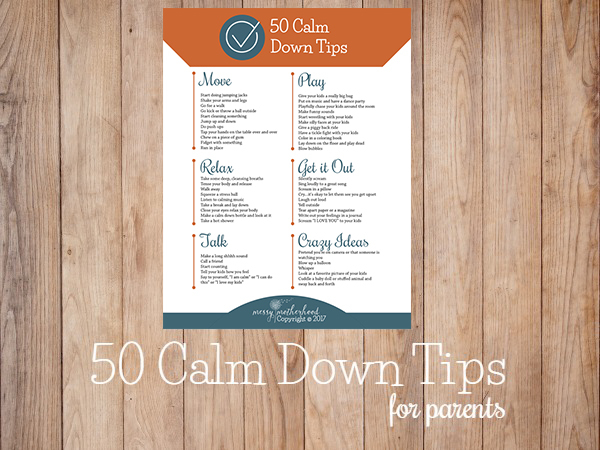 Each card also has a calm down tip on them so you can do a quick calming exercise before responding to your kids. This one tool can help you stop yelling at your kids, for good.